COMMENTARY ON "INTIMATIONS OF HOPE"
The lesson says that Jesus’ resurrection is the ultimate source of everyone’s hope, even Job’s hope which occurred before the cross, but it further blurs the issue by saying it is unclear what Job knew or understood, that he may not have understood what his sacrifices actually meant. The lesson makes the point that salvation is the hope that Job (and everyone else) has, and that somehow Job had the confidence to believe that God would save him. Salvation, according to the lesson, is realized at the second coming when the dead are raised. “Is not this hope of the resurrection to eternal life the great hope of all of God’s people through the millennia? this was Job’s hope, as well” (p. 114). Thursday’s lesson is comprised of a list of text which the reader is to look up and extract the line of reasoning being developed by the organization of the texts. The point is that the lesson’s author has strung particular texts together, ending with Daniel 2:44, to define “hope”. The texts develop the idea that God is with His people, and ultimately He will destroy the world and set up His kingdom. In fact, the lesson ignores the very clear definitions of hope in Scripture. Moreover, some of the most direct statements of “hope” were completely omitted in the lesson. The Bible defines “hope” as a sure thing, not a wish or a “maybe” that we might experience. Nevertheless, this “sure thing” is sure only for those who trust Christ. The lesson did not discuss the gospel nor what it means to trust Christ. Therefore, since we have been justified by faith, we have peace with God through our Lord Jesus Christ. Through him we have also obtained access by faith into this grace in which we stand, and we rejoice in hope of the glory of God (Romans 5:1-2). Here Paul makes it clear that our hope is rooted in already having obtained access by faith into the grace of God. We have been justified; we are not hoping to be justified. Having been justified, we have obtained access by faith into His grace, and because of that we stand in His grace and rejoice in hope of the glory of God. Our seeing Him is not a “maybe”; it is a sure thing if we have truly trusted Christ. In him we have obtained an inheritance, having been predestined according to the purpose of him who works all things according to the counsel of his will, so that we who were the first to hope in Christ might be to the praise of his glory. In him you also, when you heard the word of truth, the gospel of your salvation, and believed in him, were sealed with the promised Holy Spirit, who is the guarantee of our inheritance until we acquire possession of it, to the praise of his glory (Ephesians 1:11-14). In this passage Paul explains that we who have trusted Christ has obtained—past tense—an inheritance. We have been predestined according to the purpose of Him who works all things according to the counsel of His will. Here “hope” is used to describe placing our faith and trust in Him. Hoping in Christ is a done deal, a sure thing. We have hung our eternal destiny on Him, and it is for sure. Moreover, His indwelling Spirit is the guarantee of this now and future hope when we fully realize our inheritance. To them God chose to make known how great among the Gentiles are the riches of the glory of this mystery, which is Christ in you, the hope of glory (Colossians 1:27). Here Paul explains that the “hope of glory” is Christ IN us, the indwelling of Christ in the person of the Holy Spirit, and this miracle has been granted to gentiles to trust in Jesus. Hope is not hanging onto a possibility that something better is coming; it’s the present certainty that we are safe in Him because His Spirit indwells us. 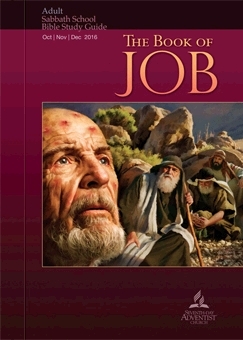 Job didn’t experience the indwelling Spirit pre-cross, but He did know and trust God as Abraham did. Both Job and Abraham believed God’s word and promises, and that was counted to them as righteousness (see Gen. 15:6). This passage does identify the return of the Lord Jesus as “our blessed hope”, but this blessed hope is based on already inheriting the righteousness and justification of God through the blood of the Lord Jesus. The lesson this week completely ignores the gospel and the powerful New Testament texts that discuss hope as the absolute assurance of our eternal security in the Lord Jesus. Instead is attempts to tie “hope” to the fact of Jesus’ resurrection and the eventual second coming. But from an Adventist perspective, these things are not hopeful; they are conditional and frightening. Adventists do not believe in the new birth as taught in Scripture. They do not believe that when one trusts Jesus, He is eternally and completely secure. Their theology demands that, in addition to believing in Jesus (however they understand that phrase), a person must accept the Sabbath doctrine and stay obedient to the law in order to be ready when Christ returns. This eventual return, then, is their “hope”…and for them, it is a wish, a desire—not a certainty that they will be eternally with the Lord. Moreover, the lesson also denies the biblical teaching of death, that when one dies, he leaves his mortal tent, and believers go into the presence of the Lord at that very moment (Phil. 1:22-23; 2 Cor. 5:1-19). For I know that my Redeemer lives, and at the last he will stand upon the earth. And after my skin has been thus destroyed, yet in my flesh I shall see God, whom I shall see for myself, and my eyes shall behold, and not another. My heart faints within me! (Job 19:25-27). Job knew God was His redeemer, and he knew He would see Him with his own eyes and in his own flesh. He knew his Redeemer would one day stand upon the earth! Job wasn’t hoping in something nebulous and unknown. God revealed to Job that He was his Redeemer and would have the last word, and that Job himself would see Him. Hope is not a nebulous “maybe” connected to Jesus’ return. It is an absolute reality that all who know Jesus experience because of Jesus’ blood and the indwelling Holy Spirit. Copyright 2016 BibleStudiesForAdventists.com. All rights reserved. Revised November 23, 2016. This website is published by Life Assurance Ministries, Camp Verde, Arizona, USA, the publisher of Proclamation! Magazine. Contact email: BibleStudiesForAdventists@gmail.com.